One method of hunting caribou was to build man-shaped stone piles [innuksut] in long, V-shaped lines across the tundra. These threatening towers of stone frightened the caribou and funneled them into an area where hunters hid, armed with bows and arrows. Oscar Koutchak: A big bow. Theresa Nanouk: That’s for big animals. Oscar Koutchak: Suuvat liima makua inupiatun? Theresa Nanouk: I bet they used to wet these things before they went hunting, because they won’t stretch when they’re dry. Oscar Koutchak: Yes. 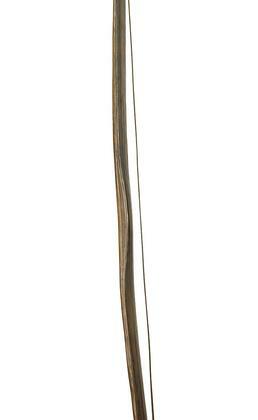 This [wooden bow] might break or [sinew bow string] this might break. Aron Crowell: What about caribou hunting with bow and arrows? Do you know stories about how people used to do that? Theresa Nanouk: I think the caribou walked right up to them, because they would walk right up to you when you’re just staying still on a snow machine. Theresa Nanouk: Where they travel? Oscar Koutchak: Yes. They built those a long time ago made out of big rocks. They used that [bow] for hunting caribou. They piled rocks and make them in the shape of a man, no arms though. They hid behind those, whenever they used this bow. Aron Crowell: And did people use bows in the old days for hunting bears too? Oscar Koutchak: I don’t know. I went with my father, and he used a 303-Savage, that’s a pretty good-sized gun. But a bow and arrow is way, way before my time. Bill Fitzhugh: Is there talk about the caribou population changing? Are there more or less caribou? Theresa Nanouk: There’s more, right? Oscar Koutchak: Yes. If I remember right, it takes fifty years for a lichen to grow back. Aron Crowell: So the caribou are increasing in the area because there’s more lichen now, there’s more for them to eat? Oscar Koutchak: Yes. When I was growing up they had a big crash in reindeer. That’s because the weather was very cold and next day it start raining. The precipitation went on top of the snow. The next day it rained and then froze again. And they can’t paw through that ice, so they just starved. Art Ivanoff: The caribou population fluctuates like any other resource. I’ve heard stories that the caribou used to migrate all the way from the North Slope all the way to Bristol Bay. But there were times in Unalakleet when there weren’t any caribou. They had to travel to Shaktoolik—what maybe ten, twenty years ago. And they’re finally returning back to Unalakleet. Oscar Koutchak: That started about fifteen, twenty years ago. That’s the first I’d ever seen a caribou come that close to Unalakleet. In fact, the first time in my life I’d seen caribou. Now there’s mostly domesticated reindeer. Aron Crowell: Are people eating more caribou in the village now? Oscar Koutchak: A lot more. 2. An inuksuk is an Inuit term for a constructed pile of stones. When stacked into the shape of a human figure, an inuksuk could be used as a hunting aid. Lines of them were strategically placed to channel migrating caribou into areas where they could be shot. Boys learned to shoot with small bows and arrows that are sometimes called “toys.”(7) Edward Nelson—who was in the Norton Sound area from 1877 to 1881—reported that boys had “toy hunting outfits” that included small bows and arrows for hunting birds. (8) In his book People of Kauwerak, Iñupiaq Elder William Oquilluk (b. 1896) wrote that his grandfather used to hunt with a bow when he was a boy. Owner’s marks—indicating individual, family or clan ownership—were painted on harpoons, darts, buoys, bows, arrows, throwing boards and other hunting gear. (16) As described by Nelson, the Unalit (Iñupiaq) people of Norton Sound marked their bows and arrows with totemic signs.